Activate Buffalo County, Kearney Public Schools, University of Nebraska at Kearney and Kearney Parks and Recreation want to encourage Buffalo County communities to make the choice to Unplug and be active during Screen-Free Week. Read a book, play a board game, take a walk or bike ride, or visit a museum. There are so many ways to be active, physically and mentally, and what better time to try than during National Screen-Free week! You even have a chance to track your activities during the week and submit your form for a chance to win a prize! 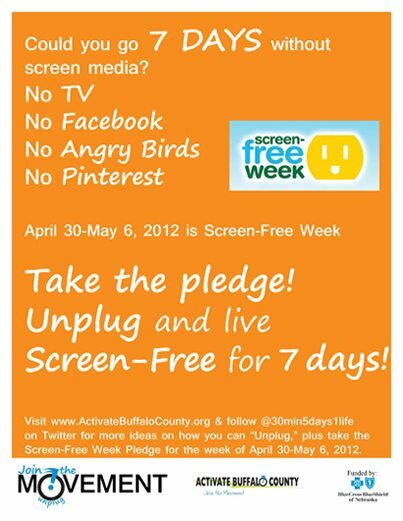 Visit activatebuffalocounty.org to download the tracking form and find more resources that can help you Unplug! Take the challenge today!